Community Professionals Apply for membership today! Twice each month, we bring in an expert to dive into advanced topics in community building that you can’t find anywhere else. 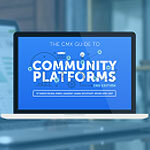 You’ll get access to CMX’s growing library of frameworks and training for community builders, updated quarterly. The community is highly curated, meaning you are surrounded by builders who are like you — smart, passionate, successful, and driven. CMX provides free resources to all Community Professionals to help them learn, support, and network with each other. These include our Facebook group, community run Slack group, and our frameworks. features plus all of the benefits listed below. Access to Facebook, Slack, and Discord groups. Bi-monthly, exclusive expert calls and access to recordings of all past calls. Access to first-come, first-serve limited 50% off pre-sale tickets. Early-bird pricing to Summit up until 2 weeks before the conference. Picking a community platform isn't easy. Use our handy guide to help you in this process. 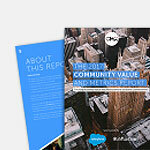 Learn what you need to build a thriving community. "Getting into community management I thought I was all alone until I came across CMX. After going "Pro", that's when I saw the true power of CMX. The in-depth articles, the face-time with other community managers, the videos, the articles... the list continues. It's like sharing with family. You know - the non-judgmental kind of family 🙂 After going "Pro", that's when I saw the power of CMX - The in-depth articles, the face-time with other community managers, the videos, the articles, the... list continues... The best part is the help I get when I have an issue and open myself up to both suggestions and critique. It's like sharing with family, you know - the non-judgmental side - of the family :)"
"What I really appreciate about this community is that it's curated with true community professionals. I'm not a fan of many exclusive things, but this exclusivity is useful because it connects you with the most experienced and insightful people. It's also good to have a member only space so I can discuss things more privately. I've already learned so much and am looking forward to learning more!" "One thing people don't realize about building a community is that you yourself need your own community of people doing similar work across a range of industries, businesses, platforms and countries. CMX Pro is that community for me. CMX Pro also gives me the assurance of a group that has my back, a ready help and resource - regardless of which stage you are in your community growth." CMX Pro has been a huge asset in getting me to be more innovative in my approach to managing my online community program. The amount of collective knowledge and willingness to share within this community has been instrumental in my growth as a community manager. CMX Pro is the spot where community professionals gather and help define what it means to be a leader in the community space. Learning from and sharing with other experts (and newbies!) in the field helps ensure my program is on the right track towards success. "I've been lucky to take advantage of CMX Summit, CMX Pro, CMX's free online resources, and CMX's online and in-person community for everything from learning the ropes as a new community professional years ago, to building a network of community industry friends I adore, to job opportunities and speaking gigs, to mentorship connections... the list goes on! I cannot overstate how helpful and supportive CMX has been. I joined in the early days, back when there were two (smaller) Summits per year, and before there was CMX Pro. (Side note: in addition to the actual training CMX provides, you can learn a lot by observing CMX's growth and how they handle it! They truly practice what they preach.) It's been exciting, and personally useful, to see CMX expand their offerings and impact; I've always loved that it's a transparent organization operating based on its values, and is run by smart, thoughtful leaders. So it's legitimately joyful to witness CMX's increasing success! More recently, it's been awe-inspiring to see CMX influence not only the trajectory of our industry as a whole, but also CMX's influence globally, through their work with Fortune100 companies whose decisions affect our day-to-day lives, whether we're in the community industry or not. I believe CMX's work is yielding positive results for all of us who participate in communities... which is all of us." Our top priority is helping you succeed in your work building communities. For some of you that means gettings a raise, a promotion or more budget. For others it means launching a successful community, migrating your platform, or growing your team. Whatever your goal, we want to help you reach it. We know it’s not easy. A lot of community professionals are solo in their companies, and it can be a thankless job. But here, we appreciate you, and we have your back. This isn’t an empty promise. Our team is committed, and we’re fully confident in the value of CMX Pro. We know it will help you in your career, because we see it with our members every day. If you don’t get 10x the value of your initial investment, then we’re not doing our job. That’s why we are offering a 30-day money-back guarantee. Give CMX Pro a spin and if after 30 days you feel that it’s just not the right fit, just get in touch with us and we will give you your money back. Simple as that.